Zoo veterinary technicians are specially trained and certified to assist zoo veterinarians with exams and procedures. 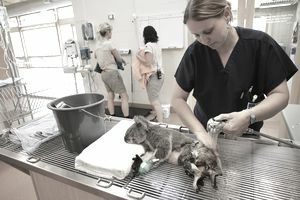 Zoo veterinary technicians assist veterinarians with exams and procedures performed on a wide variety of zoo animals. Routine tasks may include assisting with general exams, collecting samples, running diagnostic lab tests, preparing surgical sites, changing bandages, inserting catheters, taking radiographs, administering fluids, filling prescriptions, and giving intravenous or intramuscular injections. Vet techs, including zoo vet techs, may be required to work nights or weekends depending on the schedules of the zoo veterinarians. They must also be aware of the risks inherent in working with exotic animals and must take proper safety precautions to minimize the potential for injury animals who are not fully sedated. Zoo veterinary technicians primarily find employment in zoos, but they may also find jobs at aquariums and research facilities. Veterinary technicians may also transition to other positions in the animal health industry such as veterinary pharmaceutical sales or other veterinary product sales. There are over 160 accredited veterinary technician programs in the United States that grant two-year training programs. Vet techs must also be licensed in their state of residence. State certification involves passing the National Veterinary Technician (NVT) certification exam, though specific requirements may vary depending on the state. The National Association of Veterinary Technicians in America (NAVTA) recognizes 11 specialties for veterinary technician specialist (VTS) certification. The currently recognized specialties for veterinary technicians are anesthesia, surgical, internal medicine, dental, emergency and critical care, behavior, zoo, equine, clinical practice, clinical pathology, and nutrition. The Academy of Veterinary Zoological Medicine Technicians (AVZMT) offers VTS specialty certification to vet techs that have completed at least 10,000 hours of work experience in the field of zoological medicine. Additional requirements include the following: completion of at least 40 hours of documented continuing education in the field of zoological medicine, a case log consisting of at least 40 cases, five in-depth case reports, and two letters of recommendation from zoo professionals. There are also a variety of skill checklists that must be completed and documented. Veterinary technicians meeting these significant requirements are eligible to take the zoological medicine certification exam that is administered once each year. The location and test date change yearly, so it is advisable to check the AVZMT website for the latest information. Zoos may show a preference for hiring candidates who hold specialty certification in the field of zoological medicine because these individuals have demonstrated significant skill and ability in the field. Should you choose to enter this field, you'll want to join the Association of Zoo Veterinary Technicians (AZVT), which was founded in 1981 and has almost 400 professional members worldwide. The group organizes yearly conferences, publishes quarterly newsletters, educates the public, and provides networking opportunities for its members. According to the U.S. Labor Statistics Bureau, the average salary for a veterinary technician specializing in zoo animals is about $42,000 to $44,030 per year. Benefits for zoo veterinary technicians may include a number of perks in addition to basic compensation. Health insurance, dental insurance, paid vacation days, a uniform allowance or discounted admission tickets to the zoo may all be a part of the overall compensation package. Of course, as with any position, salary is commensurate with the level of experience and education. Specialists can command the high-end salary in their areas of expertise. According to the Bureau of Labor Statistics, the profession will expand over the next few years. The limited supply of new techs entering the field combined with the difficulty of achieving zoological medicine specialty certification should translate to very strong job prospects for certified zoo vet techs.